Tired of the same old first-date scenario? Want to get things flowing again with a long-term love? Time for an adventure into the unknown…or to a yoga studio! Dating and getting to know someone new can be a challenge in itself—but, going on the same old dinner dates can get stale. I am blessed to live in Colorado, where not only are people extremely active, but we’re lucky to have over 300 days of sunshine each year which allows for a lot of potential date settings. No matter where you live there are things you can do to get you and your date moving and enhancing your connection in new ways. Don’t get me wrong—a romantic dinner date can be wonderful. Exploring together, sharing new experiences and adventures or just enjoying being outside in nature can enhance a new or existing relationship and provides a change of scenery. Taking part in a physical activity is a great way to connect because it offers the ability to be spontaneous, to try something different and provides excellent motivation to turn off the cell phone, unplug from technology and eliminate the background noise that so often plagues our daily lives. Engaging in activities with one another helps you learn more about someone by doing—or showing them—about yourself rather than telling them about you. Often, on a formal date people are on their best behavior and best appearance. By getting outside and physically active, you have the chance to see a potential partner in a different setting—i.e. : not all dressed up and trying to impress you! Being able to connect with someone on various levels is important in any relationship and getting out of your comfort zone gives you the chance to see traits in your partner you might not otherwise recognize. You might learn about their competitive nature, that they have a “take charge” approach to life or conversely, that they’re more of a laidback “go with the flow” type. They may demonstrate how caring, thoughtful and considerate a person they truly are. Or, maybe you learn how they thrive on spontaneity versus being more of a planner. Regardless, getting out and enjoying physical activity together is an excellent way to increase the connection you already have. Below are some ideas to help you get out, get active, and build on that emotional connection you’re already feeling. Whether it’s a second, third or 10th date, getting outdoors and into nature is a great way to change things up. Hiking can be a good way to find out if you’re partner—or potential partner—is outdoorsy and courteous. If they help you up a steep incline or pause to wait for you should you lag behind, this is a good sign that they are a kind and considerate individual. Whereas, if they plow ahead without concern for you, leaving you in the dust, well you might want to consider what this says about how thoughtful or understanding a person they truly are. It’s also a great way to unplug and really allow you to dig deeper by having meaningful conversations because many times getting off the beaten path also means no cell signal! Working out with your partner is great way to push yourself and give each other a little encouragement. If you are a runner or enjoy running, chances are you may enjoy the company of a running partner. Maybe you both normally run three or four miles a day individually, but together you inspire each other to go farther. Conversely, maybe you’re not such a good runner but your partner is and can motivate you to become better. You might notice also if your date has a naturally competitive side—do they insist on turning it into a race? Or can they just relax and enjoy a fun jog for the sake of it? Rock climbing is a great activity for couples to try together because climbing requires trust…and trust is a key component in any relationship. There are indoor climbing gyms that offer lessons for beginners and this is a good place to start before you venture into climbing actual outdoor rock walls. When climbing, one person belays (holds the rope and takes up the slack) while the other is climbing and it’s of utmost important that you have faith in your partner and trust they will prevent you from falling should you slip. I enjoy climbing as an exercise in teamwork and trust building. If you like something a bit more challenging, this could be a great activity to try with your partner. The climber needs to be sure their partner is “taking up the slack” as they climb so that if they were to fall, they have the faith and confidence that their partner will catch them…and really, when it comes to a life partner, don’t we all want to know that our chosen partner will be there to catch us if we fall? It seems everyone in Denver has a bike—or two or three. Biking is a huge seasonal activity here. Whether its road biking, mountain biking, or taking the cruiser for a spin around one of the many parks, people love to bike around town. Biking can be a fun way for the two of you to see the sites around town, enjoy a nice day, and get in a little exercise to boot. 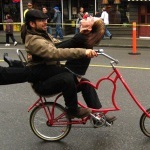 Taking the cruiser or road bike out for a spin can be a fun yet leisurely way to share an afternoon together. Similarly, if you have a lot of trails near you, and are into more fast paced activities, mountain biking together can be exciting and offers a bit more challenging or competitive way to spend time together. You also get the secondary benefit of being outside in nature and certainly one cannot text while bombing down a hill! Do you or your partner have a four-legged friend? Why not take them on a walk around a park together? Or, if you both have furry friends, try out a local dog park. If this is someone you’ve seen several times now, it might be a good idea to see how they interact with your pet and vice versa. People love their pets, so what better way to bond with someone than to try bonding with their pet? As I always say, my dog and I are a package deal. Love me, love my dog…or at least like him. 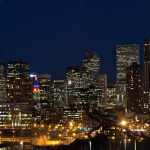 Not being a native to Denver, this is something I find interesting and a great way to create conversation and enjoy a casual date: take a tour of the city or visit various neighborhoods together. I enjoy looking at all the different architectural designs and styles of homes around Denver; they’re quite different than those homes and neighborhoods I grew up with on the East Coast. There are great little pockets in each area that offer plenty to see in terms of historic houses, beautiful parks and interesting scenery. It can be a lot of fun just wandering up and down the streets conversing about the area or snapping pictures if you’re so inclined. Taking a yoga class together is a way to spend time together while realigning yourself and your soul. Maybe he enjoys Bikram/hot yoga while you enjoy Vinyasa. Or, maybe neither of you has tried yoga, but always wanted too. Whatever the case may be, it’s always nice to show our partner that we care enough about them and their interests to try something new. After all, relationships require compromise at all stages. Maybe there’s even a studio near you that offers outdoor yoga classes for you to try. No matter what type of yoga you enjoy, building commonality and having shared interests is always good for a relationship. With spring in bloom, now is a great time to get out, get moving and generate those amazing connections! Be willing to try new things and get off the beaten path. By engaging in a variety of activities with someone, we not only learn from each other, but we uncover and share different aspects of our lives and personalities as well. At the end of the day, it’s really about having fun, opening up and discovering more about each other, which ultimately serves to enhance your bond and strengthen your relationship. Cortney Rene originally hails from the East Coast but has been calling Denver home for the past five years. She loves sunshine & beaches and has grown to love the mountains as well. She enjoys snowboarding, hiking, rock climbing, and is a dedicated Barre convert and passionate about animals. She's been blessed to have had the opportunity to live and travel abroad, and still has a lengthy bucket list of countries she wishes to see and experience. Here Comes the Sun: Date Ideas to Get Your Hearts Outside!